In this post, Marek Pękala describes a recent application of Comsol at Amphos 21 to study the saturation with water of spent nuclear fuel. This work was financed by a 7FP project of the European Commission to study fast/instant release of safety relevant radionuclides from spent nuclear fuel. Complex unsaturated flow in discrete fractures is shown. Disposal in a deep underground repository is currently considered by several countries as the preferred option for long-term management of spent nuclear fuel. For regulatory reasons the safety of such a disposal facility must be demonstrated quantitatively through Performance Assessment calculations. One of the factors that have the potential to significantly influence the results of Performance Assessment is the radionuclide release rate from the waste immediately upon contact with groundwater (the so called Instant Release Fraction). Performance Assessment calculations indicate that instant release is important for the overall safety assessment of the facility, but there are significant uncertainties about the nature of this phenomenon and how it should be represented in Performance Assessment. With the above in mind, the FIRST-Nuclides Collaborative Project was funded by the European Commission under the 7th Framework Programme of the European Atomic Energy Community (EURATOM). The project has been initiated to provide better (conceptual and quantitative) understanding of the processes involved in instant release of radionuclides from spent nuclear fuel. In the context of instant release, the knowledge of the rate of spent fuel saturation with water is key as the release of some radionuclides is contingent upon wetting of the fuel surfaces by water. Therefore, the instant release rate of these radionuclides depends on the rate of spent fuel saturation. An improved understanding of the rate of spent fuel saturation with water will help elucidate radionuclide instant release both under repository conditions and with regard to laboratory experiments conducted under near-room conditions. Under repository conditions the exposure of spent fuel to groundwater would be conditional upon the failure of multiple interconnected engineered barriers. The processes involved in such a phenomenon are multiple and coupled, making the system highly complex. As a point of departure therefore, the saturation of a single idealised spent fuel pellet was considered (henceforth referred to as the Reference Pellet). This situation can be thought of as representative of batch laboratory leaching experiments performed on complete or fragmented fuel pellets, which are performed in order to measure radionuclide release rates from spent fuel upon contact with water. The results of modelling of saturation with water of a single spent fuel pellet are directly applicable to the interpretation of laboratory leaching results, but are also the necessary first step towards more complex multiphysics models capable of representing the fate of spent fuel upon wetting under repository conditions. The conceptual model assumed that the pellet was composed of an impervious to water UO2 matrix and a network of (thermal) cracks, which can be filled with water (Figure 1). By saturation with water of the pellet is therefore understood the process of filling up of these cracks with water. 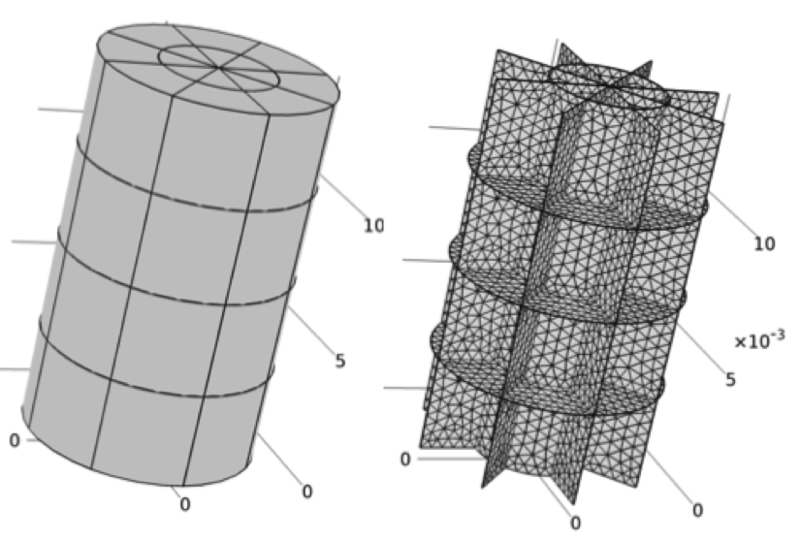 Figure 1: The conceptualised Reference Pellet (left – lines indicate intersection of cracks with the pellet’s surface) and the finite element mesh (right) of the idealised crack system. Note that water flow is considered to occur through the cracks only (the fuel matrix is impervious to water). Dimensions shown are in metres. Water penetration into the interconnected system of cracks was simulated by solving the Richard’s equation (in the pressure-based form). This was implemented in Comsol utilising the Fracture Flow interface (calculation of flow in discrete fractures), which was modified by manually implementing a storage-retention term and a set of constitutive equations (the water retention model) so as to account for variably-saturated flow within the cracks. More details on the conceptual and numerical details of the model can be found in . The primary variable solved for is water pressure, which, through the water retention model, links directly with water saturation. In order to represent the physics of water penetration a negative water pressure (positive capillary suction pressure) was prescribed homogenously within the cracks, while a positive pressure (here corresponding to 5 cm of water column) was applied to all external crack edges. The driving force for water penetration into the cracks is water pressure (capillary suction) gradients (Figure 2), which disappear after the saturation process is complete. Figure 2: Successive stages of saturation with water (from left to right) of an interconnected system of cracks in a single spent fuel pellet. The colour scale represents effective saturation (-), which varies from the initial value of 0.1 ‰ (deep blue) to unity (red) at full saturation. The model enables quantification of the time needed to completely saturate a given system of cracks, which may vary depending on the statistical properties of the cracks (e.g. their number, geometry, interconnectivity and aperture), and depending on the initial and boundary conditions used (e.g. representing the presence of partial cladding or depth at which water penetration occurs). This is useful information as it makes it possible to compare the crack system surface wetting rate with the rate of radionuclide release observed in laboratory leaching experiments. Preliminary results of this on-going work indicate that, indeed, the time scales for cracks saturation with water are comparable with those operationally defined for instant/fast release of some radionuclides (hours to weeks). We are currently working on an implementation of tracer release from the crack surface and transport by diffusion through the crack system towards an external reservoir (experimental batch solution or rock formation water in case of repository conditions). Also, the saturation model is being extended to include two distinct, but interconnected, populations of cracks (of different mean apertures). Ultimately, we intend to include relevant chemical reactions (e.g. dissolution of the fuel matrix at later stages) and upscale the model to the rod assembly scale. Work progress and results obtained in this work will continue to be presented and discussed at this blog. 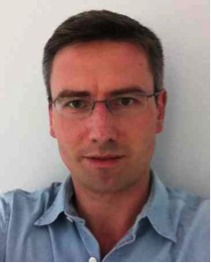 Marek Pękala is a Senior Consultant and Project Manager at Amphos 21, where he works on a range of project related to subsurface radioactive waste disposal. His primary field of expertise is geochemistry and reactive transport modelling. Pękala et al. 2012. Modelling of spent fuel saturation with water – approach, preliminajry results and potential implications. In: KIT Scientific Reports 7639, 1st Annual Workshop Proceedings of the Collaborative Project “Fast/Instant Release of Safety Relevant Radionuclides from Spent Nuclear Fuel (7th EC FP CP FIRST-Nuclides). The research leading to these results has received funding from the European Union's European Atomic Energy Community's (Euratom) Seventh Framework Programme FP7/2007-2011 under grant agreement n° 295722 (FIRST-Nuclides project). This work was carried out with important contributions from Amphos 21 colleagues: Andrés Idiart, Lara Duro and Olga Riba.